Is enticing and seductive notes of S.H.E fragrance oils blends with notes of warm, spicy undertones and enchanting with an evocative and surprising exuberance. Great smell, a soft and fresh aroma. Another one of my favorites. This bar of soap smells amazing and has a welcoming unisex scent. This is definitely a soap I'll look repurchase as well as the body butter! 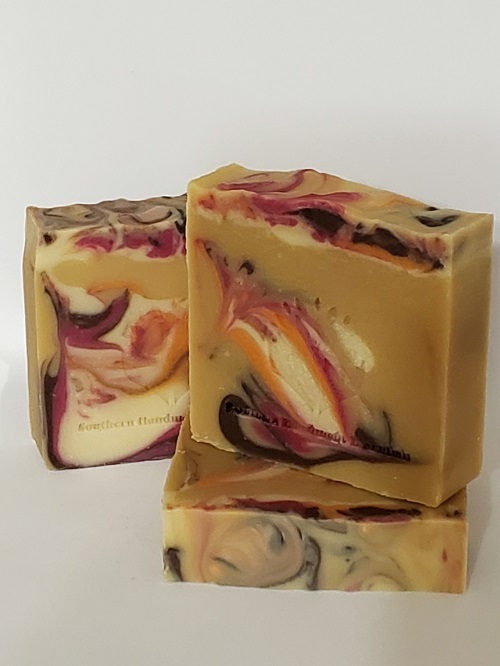 I've been using this bar for bathing for the past week and although I can't quite pinpoint which fragrance notes that I smell, the aroma is quite alluring and I find it to be somewhat relaxing. The fragrance may also have unisex appeal. Thank you were happy that you were satisfied with our products! We also appreciate your feed back!